Americans have complex views about immigrants living in the U.S. today. On balance, U.S. adults are somewhat more likely to say immigrants are making American society better in the long run (45%) than to say they’re making it worse (37%). Yet these views vary widely by education, race and partisan affiliation. And when asked what one word comes to mind when they think about immigrants, “illegal” is cited most often (12%). These are among the findings of a nationally representative, bilingual survey of 3,147 adults from the Pew Research Center’s American Trends Panel conducted online March 10 to April 6, 2015. The survey’s margin of sampling error is plus or minus 2.4 percentage points at the 95% confidence level. Since the 1960s, the nation’s immigrant population has grown rapidly and has dispersed across the country as areas in the southeastern U.S. and the Pacific Northwest—which are not traditional immigrant gateways—have experienced significant growth in their foreign-born populations in recent years (Pew Charitable Trusts, 2014). As a result, many Americans now live in places that have immigrant communities. According to the new survey, about three-quarters of U.S. adults (78%) say there are immigrants living in their community. Among all Americans, about a quarter of adults (27%) say there are many recent immigrants, in the community where they live, 31% say there are some and 18% say there are only a few. Just 2% of U.S. adults say there are no recent immigrants in their community. Those who live in urban areas are the most likely to say there are many recent immigrants living in their community; 34% say so, compared with 17% of those living in a rural area and 24% of those in the suburbs. Westerners are the most likely to say there are many recent immigrants in their community. About a third (35%) of people living in Western states say this, while 28% of those in the Northeast, 26% of those in the South and 17% of those in the Midwest say the same. Overall, about one-in-four (24%) Americans say they have a friend or relative who is a recent immigrant. This share is highest among those who were born outside the U.S. themselves (47%), younger Americans (36% of those ages 18 to 29) and Hispanics (39%) as well as those with college degrees (33%). When asked what one word first comes to mind when thinking about immigrants in the U.S. today, the word “illegal” is offered by 12% of American adults—more than any other word. Other respondents offered words such as “overpopulation” (5%), “legality” (4%), “jobs” (3%), “deportation” (3%) and “work ethic” (3%). Americans are more likely to say immigrants to the U.S. are making American society better than making it worse. According to the survey, a plurality of Americans (45%) say that immigrants coming to the U.S. make American society better in the long run, while 37% say they make society worse and 16% say immigrants don’t have much of an effect one way or the other. But there are major differences in the way different groups of Americans answer this question, with immigrants themselves, college graduates, Hispanics and younger Americans much more likely to be sanguine about the impact the foreign born are having on the United States, while Republicans, those with a high school diploma or less, and whites are more likely to have the most negative views of immigrants’ impact on the U.S.
Hispanics are more likely than whites or blacks to say immigrants are making U.S. society better, possibly reflecting the groups’ strong recent immigrant roots.19 According to the survey, about six-in-ten (61%) Hispanics say that in the long run, immigrants to the U.S. are making American society better while just 20% say they make it worse and 17% say immigrants have not had much effect on U.S. society. By comparison, 44% of blacks say the impact of immigrants is positive, a plurality among them. But among whites, while 41% say immigrants make American society better in the long run, a similar share (43%) says immigrants make American society worse. The survey also finds sharp partisan differences in views of immigration’s impact on the U.S. Among Democrats, 55% say immigrants are making American society better in the long run, while 24% say immigrants are making things worse and 18% say they are not having much effect. But among Republicans, views are nearly the opposite: 53% say immigrants are making American society worse in the long run, while 31% say they are making things better. An additional 12% say immigrants are not having much effect on American society. Meanwhile, independents lean more positive than negative, but less so than Democrats: 45% say the impact is positive on American society in the long run, 37% say it is negative and 16% say there is not much effect. Younger Americans are more likely than older Americans to see the impact of immigrants on the U.S. in the long run positively: 54% of those ages 18 to 29 say this, compared with 44% of those ages 30 to 49, 41% of those ages 50 to 64 and 39% of those ages 65 and older. There is also a large education gap in views: among those with a college degree, about two-thirds (64%) say immigrants make American society better in the long run. A far lower share among those with some college (44%) or with a high school diploma or less (32%) share this view. As might be expected, immigrants themselves are also more likely than non-immigrants to say immigrants make American society better in the long run. Fully 68% of immigrants say this is the case, while 42% of those who were born in the U.S. agree. U.S.-born adults who live in places with immigrant communities feel more positively about immigrants. About half (45%) of this group say immigrants make American society better in the long run, compared with 33% of those who say there are no immigrants living in their community. Public attitudes toward immigrants have grown more positive since the mid-1990s, according to Pew Research Center surveys (Pew Research Center, 2015a). About half of U.S. adults today (51%) say that immigrants strengthen the country because of their hard work and talents, compared with 41% who say that they are more of a burden because “they take our jobs, housing and health care.” In 1994, opinions were flipped: Almost two-thirds of Americans (63%) said immigrants were a burden, while 31% said they strengthened the country. Americans’ views of immigrants differ widely depending on their region of origin, with immigrants from Asia and Europe seen more positively than those from Latin America, the Middle East and Africa. However, while about four-in-ten Americans say the impact of immigrants from Latin America and the Middle East has been mostly negative, only 22% say this about African immigrants while half say they have had neither a positive nor negative effect. The most positive reviews are reserved for Asian and European immigrants. According to the survey, 47% of U.S. adults say the impact of Asian immigrants on American society has been mostly positive, just 11% say their impact has been mostly negative and 39% say it has been neutral. When asked about the impact of European immigrants, views are similarly positive. Some 44% of U.S. adults say European immigrants’ impact on American society has been mostly positive, 9% say it has been negative and 45% say it has been neither. Meanwhile, Americans are more likely to say the impact of Latin American immigrants on U.S. society is mostly negative (37%) than to say it is mostly positive (26%). An additional 35% say the impact of Latin American immigrants on U.S. society is neither positive nor negative. When it comes to immigrants from the Middle East, American’s views are just as negative as they are about Latin American immigrants. Some 39% of U.S. adults say Middle Eastern immigrants have had a mostly negative impact on American society, while 20% say the impact has been mostly positive and 39% say the group’s impact has been neither. Views of African immigrants are somewhat more mixed. While 26% of U.S. adults say the impact of African immigrants has been mostly positive and 22% say the impact has been mostly negative, half (50%) say it has been neither—a higher neutral view than for any other group of immigrants. There are some differences by race and ethnicity. Whites are more likely than blacks and Hispanics to say that Asian and European immigrants have a positive effect on American society, while Hispanics are the most likely to say that Latin American immigration has been a positive development for the U.S. For example, 49% of whites say that European immigrants have had a positive impact, compared with 34% of Hispanics. But just 23% of whites think Latin American immigrants have had a positive impact on American society, while 39% of Hispanics say the same. Almost identical shares of Democrats, Republicans and independents say European and Asian immigrants have had a positive effect on American society (though Republicans are more likely to say each of these groups has had a negative effect). But when it comes to the impact of Latin American, African and Middle Eastern immigrants, Democrats and independents are consistently more positive than Republicans. For example, Republicans are much more likely to say that Latin American immigrants—the largest group of immigrants among today’s modern wave—have had a negative impact (58%) than to say they’ve had a positive impact (13%), while 36% of Democrats say they’ve had a positive impact and 23% say a negative impact. Among independents, 35% say the impact of Latin American immigrants has been mostly negative, while 27% say it has been mostly positive. When asked whether immigrants are making some areas of U.S. life better or worse, the American public expresses mixed views. On the one hand, Americans see immigrants as making things better—for example, 49% say immigrants in the U.S. are making food, music and the arts better, while few see them harming these areas of life and 37% say they aren’t impacting these areas either way. 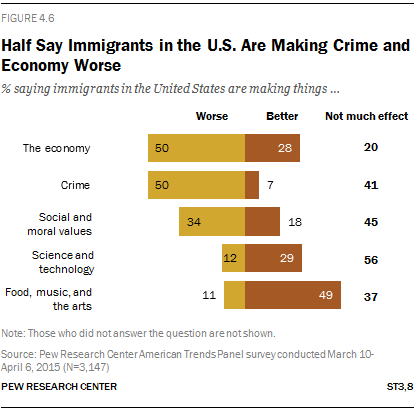 On the other hand, fully half of U.S. adults say that immigrants make American society worse when it comes to crime, while just 7% say they are making things better and 41% say they are not having much effect.20 Similarly, 50% say immigrants are hurting the American economy, significantly more than say they’re making it better (28%) or not having much effect (20%). In still other areas, the largest share of Americans expresses neutral views. When it comes to social and moral values and science and technology, close to half of adults think that immigrants don’t have much of an effect (45% and 56%, respectively). Yet, more say immigrants are making social and moral values worse than say that they are making them better (34% versus 18%, respectively), while the opposite is true in regard to science and technology (12% versus 29%, respectively). Even though the U.S. public has strong views about the impact nationally of immigrants on food, music and the arts, the economy, and crime, their views of immigrants’ impact in their own communities are more neutral.21 For example, among adults who say there are immigrants in their communities, about half say that immigrants don’t have much of an impact on crime in their community (53%), job opportunities (50%) and food, music and the arts (46%). And about four-in-ten (41%) say immigrants don’t have much of an effect on community schools. To the extent that people think immigrants have had an impact on their communities, relatively few think they are making things better in most cases. For example, only 8% say immigrants lessen the crime problem in their communities, while 36% say they are making things worse. Only a small fraction say job opportunities for themselves and their families are better because of immigrants (11%), while three times as many say immigrants are making things worse (36%). Some 15% say immigrants are making schools better, while more than twice as many say they are having a negative impact on schools (41%). Meanwhile, even though about half of Americans say immigrants do not have much impact on food, music, and the arts in their communities, among those who do have an opinion, nearly five times as many say immigrants are making things better (42%) than say they are making things worse (9%). When asked why most immigrants come to the United States, Americans overwhelmingly say it is for economic opportunities (74%). This far exceeds the share giving the reasons of conflict or persecution in their home country (10% believe this is the main reason), educational opportunities (4%), and being reunited with family (2%). Immigrants are just as likely as those born in the U.S. to say that economic opportunities are immigrants’ main reason for coming to the U.S.—75% and 74%, respectively. But immigrants are less likely to give conflict or persecution in their home country as a reason compared with U.S.-born adults—6% versus 11%, respectively. While the U.S. public believes economic opportunities drive immigrants to come to the U.S., previous research suggests that these are not the only or even most common reason given by two of the largest immigrant groups—Hispanics and Asians. A 2011 survey of Hispanic adults (Taylor, Lopez, Martínez and Velasco, 2012) found that among Hispanic immigrants, while most (55%) cited economic opportunities as the main reason they came to the U.S., they also cited family reasons (24%), educational opportunities (9%), and conflict or persecution in their home country (5%). Among Asian immigrants, by contrast, other reasons were cited more often than economic opportunities for coming to the U.S. According to a 2012 survey of Asian Americans (Pew Research Center, 2012), 31% of Asian immigrants cited family reasons as the main reason, followed by 28% who cited educational opportunities, 21% who cited economic ones and 9% who indicated conflict and persecution. About two-thirds (66%) of Americans say that immigrants generally want to hold on to the customs and way of life of their home country, while just about a third (32%) believe immigrants want to adopt American customs and way of life. A large share of the foreign born themselves (55%), say that immigrants to the U.S. generally want to hold on to the customs of their home country, while 42% say immigrants want to adopt American customs. Just as most Americans believe immigrants want to hold on to their home country’s customs, about six-in-ten (59%) also say that most recent immigrants do not learn English within a reasonable amount of time. At the same time, 76% of Americans say adult immigrants in the U.S. need to learn English to succeed. Among immigrants themselves, most (56%) believe most recent immigrants do learn English in a reasonable amount of time, while 43% say they do not. But just like the general public, most immigrants (77%) say learning English is important for success in the U.S. The view that immigrants generally don’t want to assimilate is particularly widespread among Republicans; 81% say this, compared with 66% of independents and 55% of Democrats who say the same. Some three-quarters of Republicans (74%) say immigrants do not learn English in a reasonable amount of time, compared with 45% of Democrats. Independents fall in between, with 59% saying immigrants do not learn English quickly enough. Those who have relatives or friends who are immigrants have views similar to immigrants. They are more likely than those who don’t have any foreign-born friends or relatives to think that most recent immigrants learn English within a reasonable amount of time (51% vs. 36%). But they are slightly less likely than those without close immigrant ties to think immigrants need to learn English to succeed (71%, compared with 78%). Americans mostly believe that the U.S. immigration system needs changes. According to the new survey, 54% say the immigration system needs major changes and an additional 28% say it needs to be completely rebuilt. Only 16% say they think it works pretty well and requires only minor changes. This negative assessment of the U.S. immigration system is also held among those most likely to interact with it—immigrants. Half of this group (also 54%) thinks the immigration system needs major changes, though they are more likely than the general public to say that it works pretty well (25%) and less likely to think it needs to be completely rebuilt (18%). These findings are similar to those found in a 2013 Pew Research survey of U.S. Hispanics and U.S. Asians (Lopez et al., 2013). Overall, 62% of Hispanics and 47% of Asians said that the U.S. immigration system needs to be completely rebuilt or needs major changes. As for how many immigrants are coming to the U.S., about half of Americans say that immigration should be decreased (49%), while 34% think it should be kept at its present level and 15% say it should be increased. Republicans are twice as likely as Democrats (67% vs. 33%) to think immigration to the U.S. should be decreased. And the U.S. born (51%) are more likely than immigrants (30%) to say immigration should be decreased. When it comes to the government deciding who should be allowed to legally immigrate to the United States, a majority (56%) would prefer giving priority to people who are highly educated and highly skilled workers, even if they don’t have family members in the U.S., over people who have family members already living in the U.S., even if they are not highly educated or highly skilled workers (37%). Democrats are evenly split on this issue, with 47% saying the government should give priority to highly educated and highly skilled workers, and another 47% saying preference should go to immigrants who have family members already living in the U.S. Republicans lean toward giving priority to highly educated and highly skilled workers (65%), as do independents (59%). People who are most highly educated themselves are most likely to support giving priority to highly educated and highly skilled workers (61% of those with a college degree or more vs. 55% of those with some college or less). Younger Americans (59% of those ages 18 to 49 vs. 52% of those ages 50 and older) and whites (60% vs. 42% of blacks and 48% of Hispanics) are also particularly likely to say this. Immigrants’ views closely mirror those of the U.S. born on this question. In addition to asking about people’s views of immigrants and immigration policy, the survey tested people’s knowledge of some key facts about immigration to the U.S. today. Almost half (47%) of respondents correctly answer that 13% of today’s U.S. population was born in another country.23 But 35% of Americans say that the U.S. foreign-born share is actually higher: 28% say about four-in-ten Americans are foreign-born, and 7% say that more than half of the U.S. population is foreign born. Just 8% of U.S. adults say the U.S. foreign-born share is less than 13%. When it comes to the characteristics of immigrants, the U.S. public is less knowledgeable. For example, about a third (34%) of respondents correctly say that 26% of all immigrants in the U.S. today are living here illegally. But about as many overestimate this share: 22% of U.S. adults say that 45% of the U.S. immigrant population is living here illegally, and 14% answer that 62% of U.S. immigrants are in the country illegally. An additional 20% say that 9% of U.S. immigrants are living here illegally. Americans are especially unaware of recent changes in the origins of immigrants who arrived in the past five years. Fully two-thirds (69%) say Latin American immigrants make up the largest group of recent U.S. immigrants. In fact, Asian immigrants are the largest group of recent immigrant arrivals, an answer given by only 7% of U.S. adults. An additional 13% of respondents answered Middle East, and 3% each answered Europe and Africa.